Another festive outfit with some of my new favourite pieces by Hell Bunny! 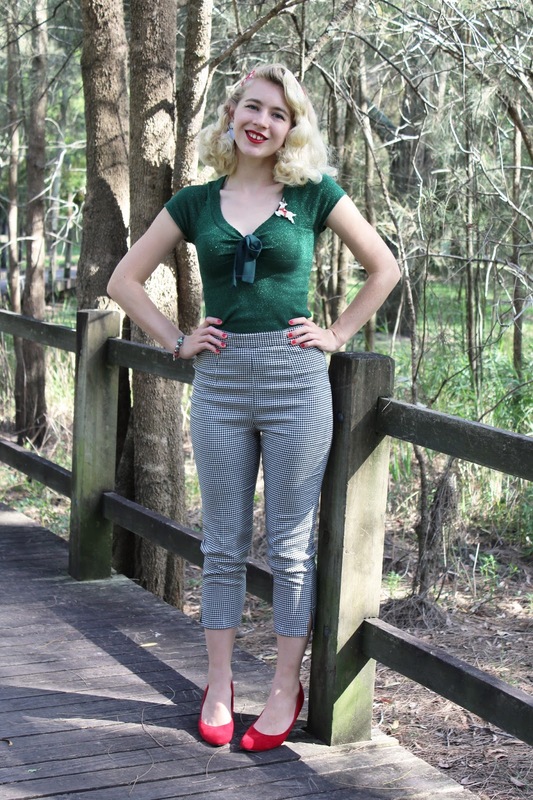 Hell Bunny cigarette trousers are becoming my Autumn and Winter staple... Yes it is summer here but I managed to wear these out early in the morning a couple of times. 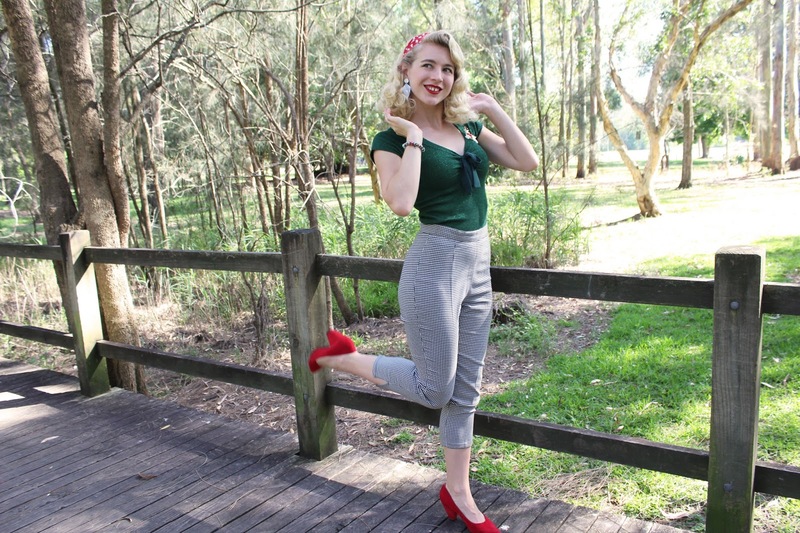 Earlier this year I added a couple of Hell Bunny cigarette trousers to my wardrobe and was so happy with how comfy they are and how nice they look on, these are another welcomed addition to my wardrobe. I wore my regular size xs for Hell Bunny and the fit is spot on as usual. Now this top is an absolute dream, it's got the gorgeous lurex look, it has a beautiful fit and a gorgeous bow tie. I love wearing green and I thought it would look great with these trousers, I thought they would be a great pairing when I was flicking through the catalogue. The top is nice and soft to wear and not itchy at all, it's a great top to wear all year round. 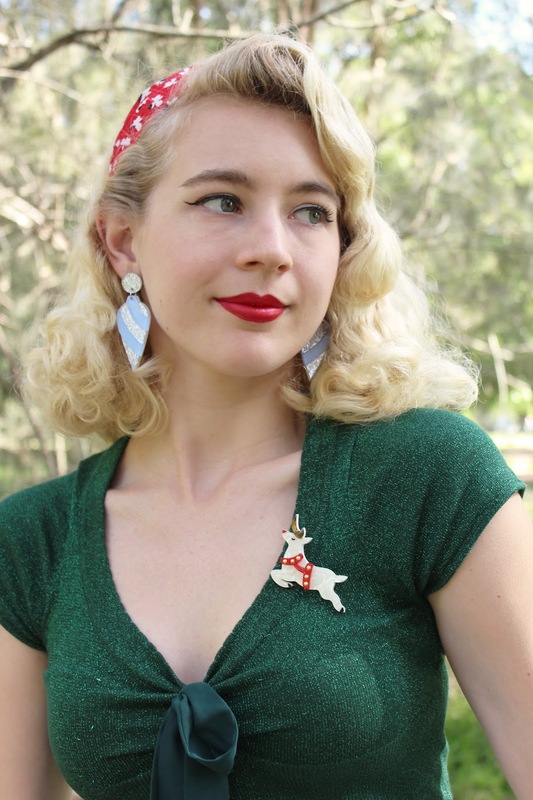 I love that the sparkle gives me a little bit of glam for quite a casual outfit and since it's Christmas time I had to add my festive accessories to complete the look. I went for size xs and it has a bit of stretch to it as well. I did some Christmas shopping yesterday and post office run, I probably should have started gift shopping earlier but Christmas is pretty relaxed these days. We always have our Christmas meal outr in the backyard and we will be cooking most of our food on the BBQ this year, we love to fire up the BBQ each week. I will be making a chocolate trifle, I'm looking forward to making + eating it! The weather has been so stinking hot, it was a relief to hang out in the air conditioned shops that past couple of afternoons/evenings. I'm hoping that I can get to the beach this weekend or on my birthday! If you have your eye on something from Hell Bunny be sure to use the coupon code GVintage20!% to recieve 20% off your order! I can't wait to share my next Hell Bunny outfit post! This outfit is lovely - really Christmassy in the colours but not too over the top Christmas, as in you could wear this on a normal day too! I love the top and think I really need one now! Winning colour combo for this season! 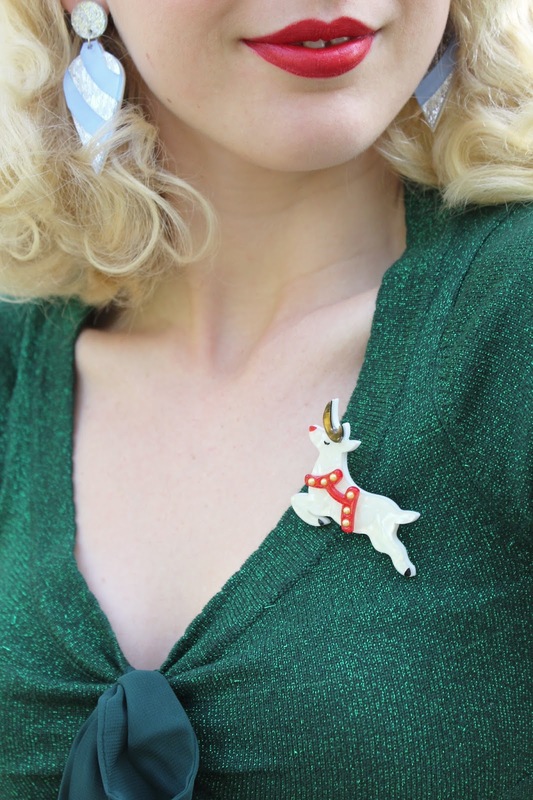 And a cute brooch is always a welcome addition, it makes all the difference to an outfit.